Whether you are playing ping pong table tennis or other game, can be fit your health. Every game makes fit and keeps a good health. But one of the best exercises is table tennis it keeps your health with good fitness. Do you have a question why is good exercise you have chosen table tennis. Now what are the most benefits there are- It improves your hand eye contact coordination. Playing table tennis makes control your balance. It improves your mental acuity and keeps brain sharp. Whether you play in the community center or at home with friends, table tennis offers a great way to bond with other people while you lose weight. Because young and old people can play the game, it can help improve communication and build relationships, irrespective of age. Playing at home with siblings or parents can bring family members closer and enable them to spend more quality time with each other. So now I have pointed some of benefits in the below it can make fit and build a good relationship for your health. Table tennis makes 100% eye contact for your concentration. Actually it simulates mental alert and concentration with daily activities. This is also makes sharpen reflex for young people and for older people to refine tactics. So you can realize why is the best table tennis for health exercise? Hopefully you got the point about table tennis benefits in health fitness. Did you spend the free times in playing table tennis on one of the great outdoor table tennis game? If yes. You are the right way for your health benefits with keeping your brain sharp. Table tennis requires a developed sense of strategy that is similar to that of Chess. The game starts well before the serve. You study your opponent and learn their tendencies so that your next move becomes a calculated reaction. Playing table tennis increases the flow of blood to the brain, and could possibly even prevent dementia. Japan statics are reported it. Therefore table tennis makes to keeping brain sharp and improves skills in your brain. 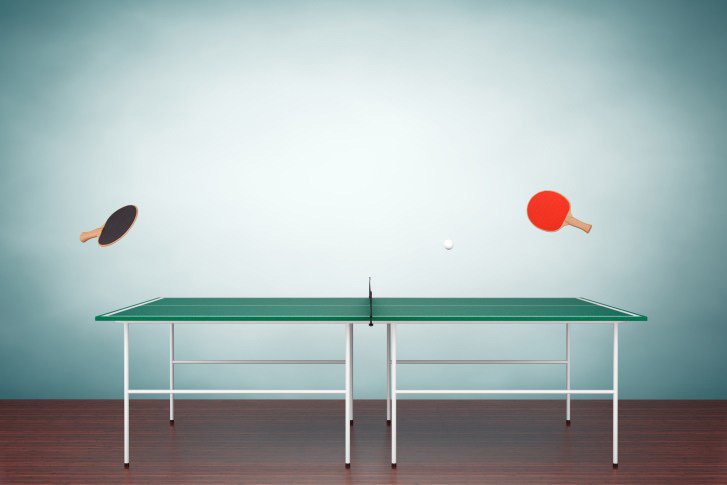 Table tennis improves quickly to able balance successfully in a ping pong. Balance allows the creation of force and determines the efficiency of movement. It's not to be underestimated! Static balance: This is probably the first thing to pop into your mind when you think of "balance". An example of static balance would be your ability to stand on one leg. Dynamic balance: This iThis is the balance we need for table tennis. Dynamic balance is the ability to keep the body in equilibrium whilst making movements.s the balance we need for table tennis. Dynamic balance is the ability to keep the body in equilibrium whilst making movements. Develops mental acuity: "Your brain needs novelty to grow," says Jones. Really we need to develop our mental acuity. Therefore we need players are highly skilled in both creating and solving puzzles involving these three attributes. So, one of the mental acuity can develops by playing table tennis. It helps to develop our mental acuity. It’s easy on the joints: If you have knee surgery, back problems, tired of twisting your ankles? Try table tennis. It's a great way to improve your leg, arm and core strength without overtaxing your joints. It helps to joint your knee surgery, back problems, or any other problems. Can Table Tennis Help Me Get Fit? Yes. Playing table tennis can help you to get fit for your health to improve your strength and stamina you need to add more exercise. There are a few of the benefits and over time you start to see your body fat reduce, your game improve and your reaction times get shorter. Importantly your mental focus will get much better. As you progress with your fitness and game strategy you and your friends will become addicted to getting better. It's one of the coolest games around! I would recommend everybody 1 or 2 hours for playing table tennis that make you good fitness. I try to play daily as well, that way I know that I have done some fitness and sports three times a week. I know that this sounds a lot as most people have other commitments like work, families or studies. Believe me if you commit and stick to this and force yourself to go, after a while it will become second nature and you will start to see that you will have a massive improvement in your overall fitness. I hope you will be good fitness in playing table tennis and be a good health with enjoyable. What Exercises Can I Do To Improve My Ping Pong Game? I have exercise with ping-pong game once time daily and worked as a coach with Olympic player as well gained from other coach. Actually it can be improve your ping-pong game to take a training camp. Because there are facilities to produce some nationally ranked table tennis players and has played at nation and international level. They can help you as they have skills into ping pong. If you are serious I think it is better recommended for you. Hope you will improve your Ping-Pong game. Can Ping Pong Be Considered Exercise? It is definitely a good workout, but it also depends on a lot on your style of play. If you are a pusher who just plays close to the table taking at best a couple of steps to the left or right, you won't get a lot of exercises, but you will still burn calories. But if you play a game that involves a lot of movement back and forth, attacking and defending, moving to cover sides of the table, moving around to turn backhands into forehands, yep, then it's a great workout. Then you can actually use it to lose weight. I did!